Online sportsbook Paddy Power gives out Horse Racing Enhanced Offer for the Goodwood Cup tomorrow (July 28). 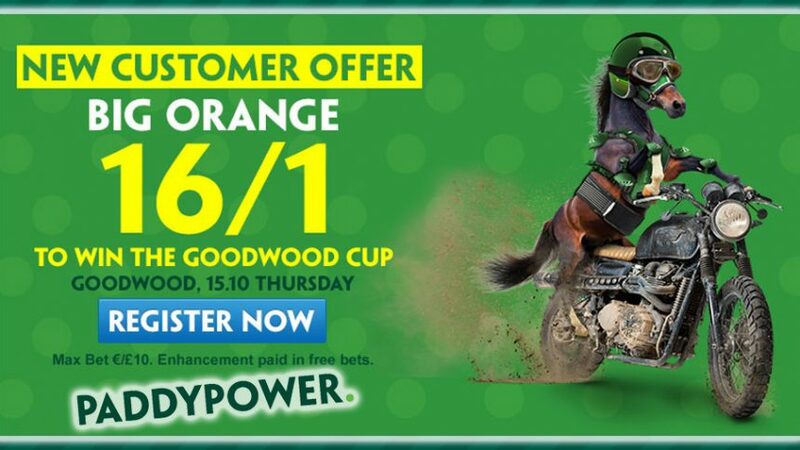 Place a simple £10 bet on Big Orange to win the Goodwood Cup and you could be pocketing 17 times that amount with the Horse Racing Enhanced Offer 17.00 (16/1)! Make the wager ASAP before the offer runs out at 15:10 BST tomorrow (July 28)! If Big Orange crosses the finish line first you’ll receive your winnings based on the original price offered by the online sportsbook, while the rest of the of the amount will be paid to you in Free Bets that will see the total winnings get up to 17.00 (16/1). Under jockey Jamie Spencer and trainer Michael Bell, Big Orange won the Goodwood Cup last year so the team will be looking to replicate the success to clinch back-to-back titles. The last horse to win consecutive Cups was Double Trigger in 1997 and 1998 – trained by Mark Johnston – although the riders were different with Michael Roberts claiming the first trophy and Darryll Holland clinching the second one. Place your bets now with Paddy Power’s Horse Racing Enhanced Offer 17.00 (16/1)! Wager with Horse Racing Enhanced Offer!